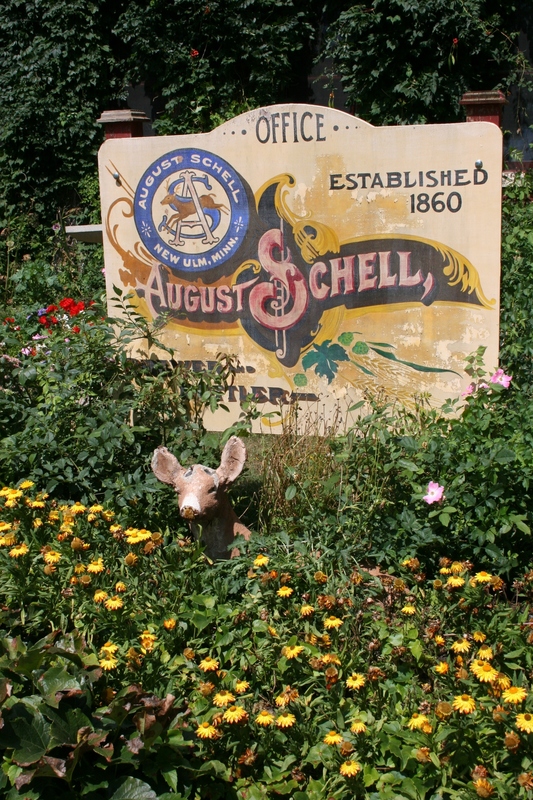 August Schell Brewing Company sign and deer by the corporate office. I MUST ADMIT THAT prior to my recent tour of the August Schell Brewing Company, I had never really thought about the deer image that brands this New Ulm beer. But, as our tour guide explained, company founder August Schell loved the white-tail buck. Indeed he did. Everywhere I turned and walked and looked, I saw deer on the Schell’s company grounds. Only the real deer, which typically are visible to the public, were not around because of health issues, or something like that. All of these deer got me thinking. Maybe the brewery could add a deer “hunt” to its tours as an activity for children and teens. I bet most kids don’t find the tour all that interesting because it’s geared primarily for adults. A deer scavenger-type hunt would provide an entertaining diversion for the younger generation, or for all ages. I saw grandparents with their grandchildren and I’m certain the elders would welcome a cross-generational activity like this. 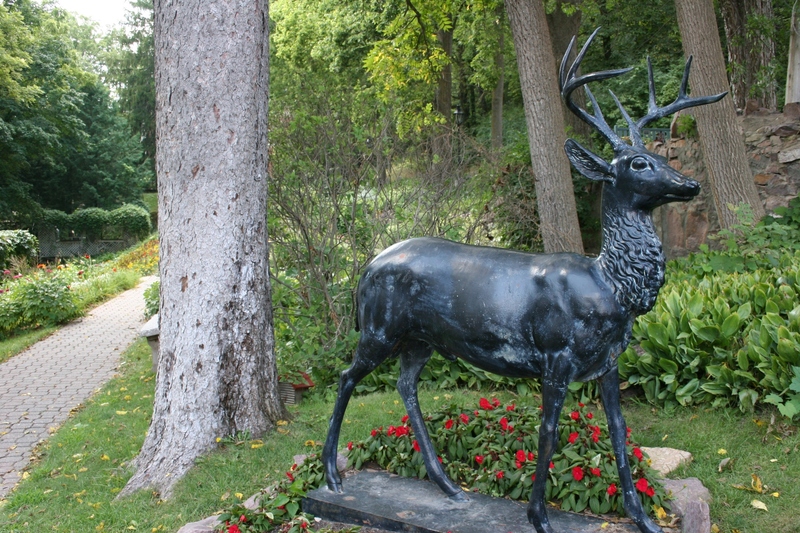 A stately buck statue stands on the edge of the wooded area which resembles August Schell's native Black Forest. Or: Only the Schell’s company president can live here. 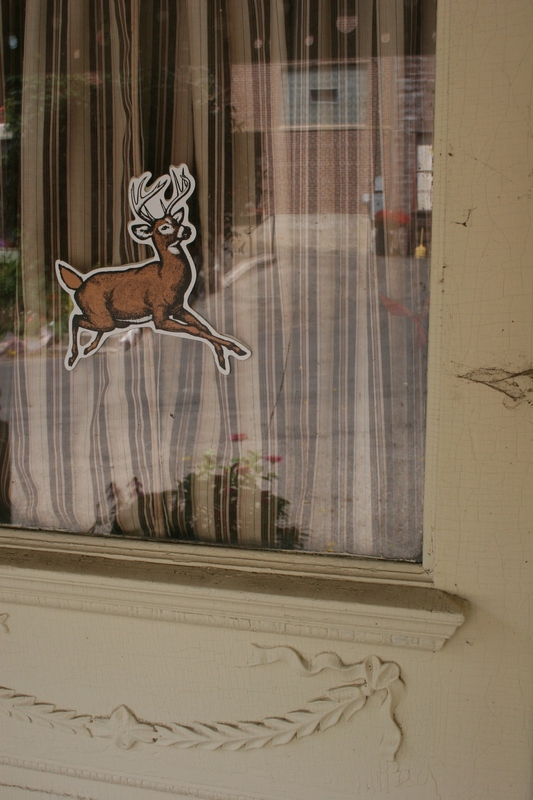 A deer image above an exterior door on the Schell's retirement mansion, where only the president may live. Or: Land a bass when you find this deer. 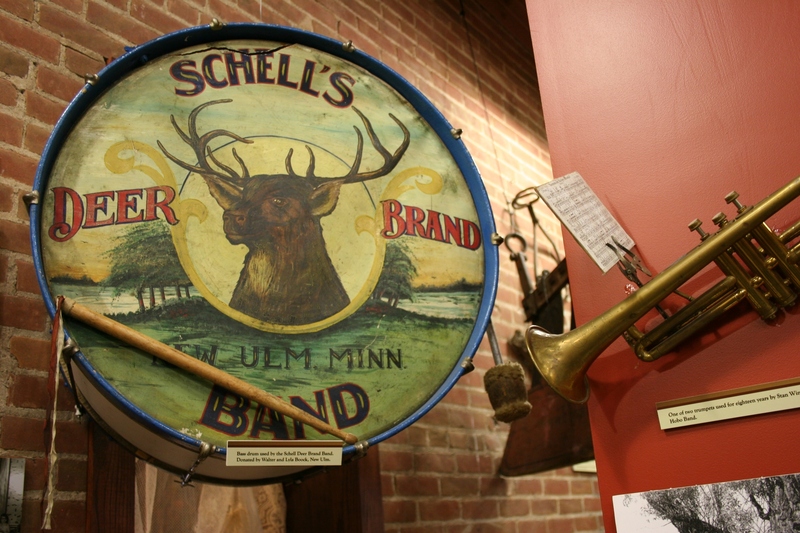 A Schell's Hobo Band bass drum in the brewery museum. Game participants would search for the deer, all the while learning about Schell’s and its history. And the brewery would be imprinting the deer brand upon the unsuspecting guests. Of course, to reward the deer hunters, Schell’s could offer some little deer-stamped trinket to be claimed in the gift shop after the hunt. (That would increase gift shop traffic, which could also increase sales.) The kids would be happy. The parents and grandparents would be happy. What do you think? Should Schell’s give my idea a shot? 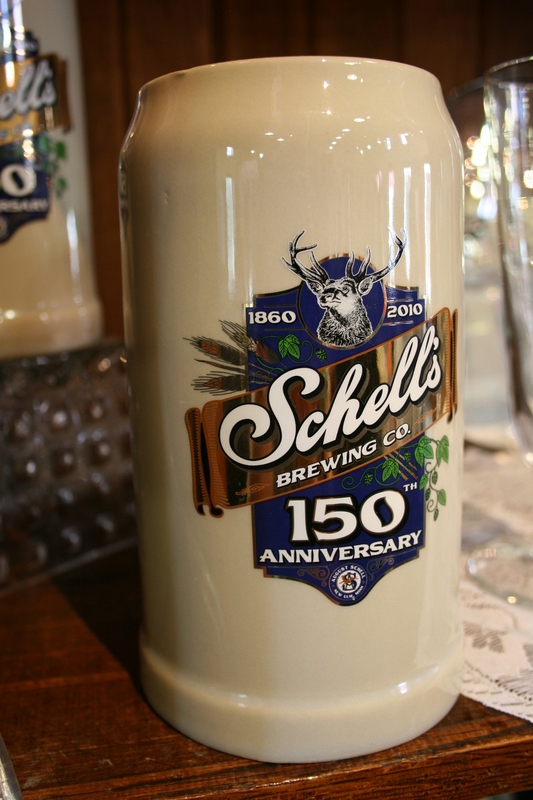 A deer-branded 150th anniversary beer mug in the gift shop. 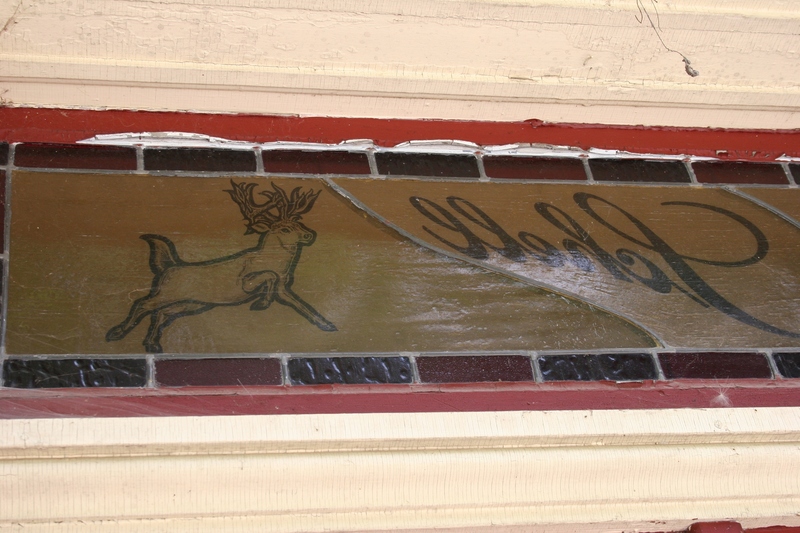 A Schell's deer emblem on the door of the house that once was home to brewery workers during the company's early years. 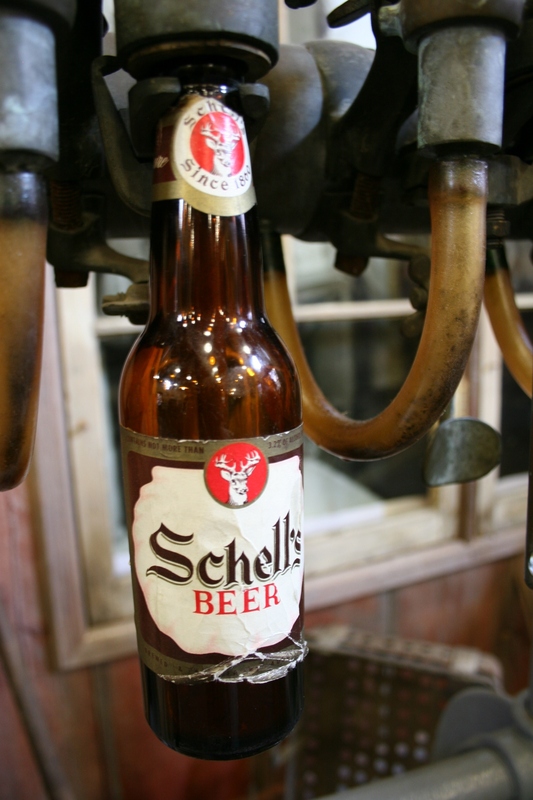 Bottling Schell's deer beer, a museum display. 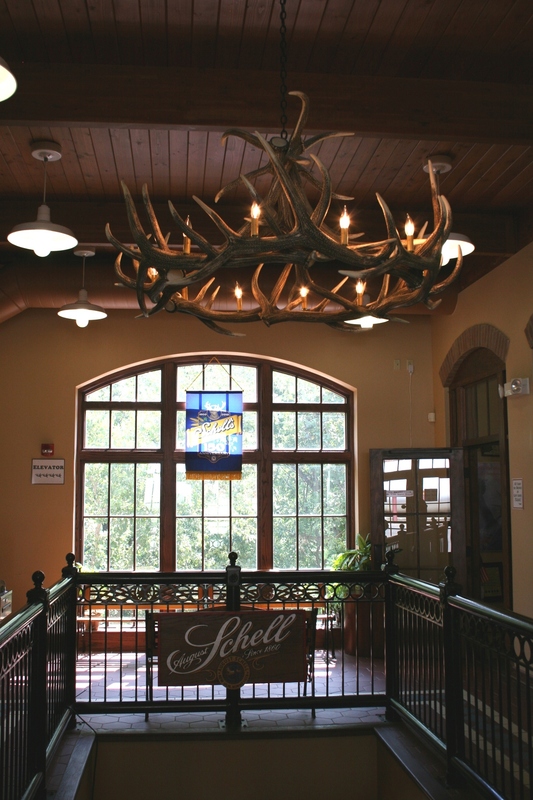 A successful hunt: Deer antlers form a light in the commons area that links the gift shop and museum on the main floor. 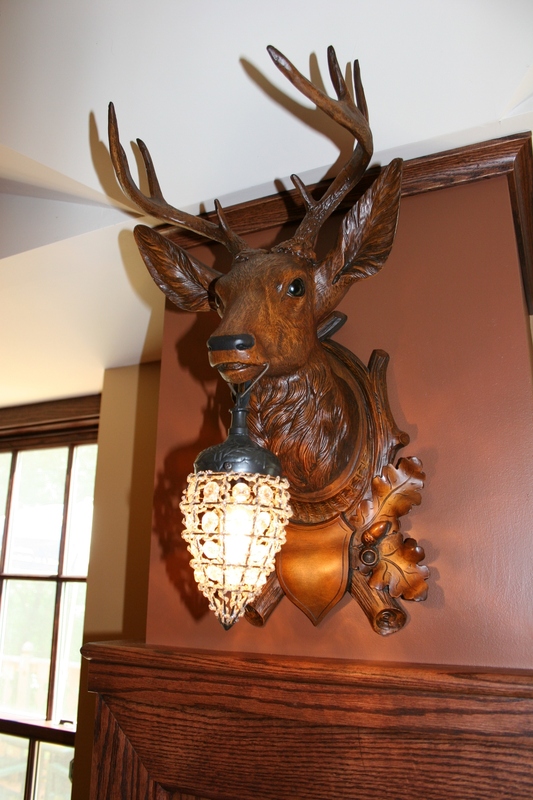 A carved deer light in Schell's hospitality room. AS A SIDE NOTE, in the book Land of Amber Waters: The History of Brewing in Minnesota by Doug Hoverson, you’ll find a photo of the original Schell’s family home, today the company office. Look closely at that image on page 35 and you’ll see deer antlers stuck on the front of the brick house, between the front first and second floor windows.